Hotels aren’t the only facilities hoping on the bandwagon. Seeing that more than 50% of America’s families have pets, those that have vacation homes are making pet friendly accommodation a part of its package. Restaurants, while still pets are typically only allowed on the patio, still are making their services available to pet owners. Check out our listings of pet friendly restaurants for every U.S. city by typing your travel destination in the our Travel Guide search box. Here you will find pet friendly restaurants, parks, beaches, activities, events, kennels, pet sitters and more. With pet friendly accommodation finally taking root in America, Vacation Pet Friendly has taken great strides in providing you with everything you will need when planning your trip and while at your destination. The key to a vacation is to be prepared so you can spend your time having fun. This translates into “do your research first.” A good way to start is to input the city you are considering visiting our Travel Guide for your destination. Here you will find all types of pet friendly accommodation including pet friendly hotels, cabins, vacation homes and bed and breakfasts. This page also has categories including pet friendly parks, beaches, restaurants, events, expos, activities, interesting places, hotels, motels, vacation homes and much more for that particular destination. Once you decide where you are going, you will then need to research the hotels and perhaps other types of pet friendly accommodation. The main thing most hotels take into consideration s the size of your animal. Hotels tend to like dogs and cats 25 pounds or less. However, often you can sway them into accepting larger dogs as long as he is well mannered. Every establishment that offers pet friendly accommodation will have its own policies, which are listed at Vacation Pet Friendly. Some places restrict by breed, rather than size. You will want to check that your animal fits within the restrictions. This information may be found on our hotel listings pages. When you book with Vacation Pet Friendly, you will receive an email confirmation with your confirmation number and other pertinent information. Make sure you have this information with you when you travel. Also, if you have a pet in two, we advise you call the hotel a week or two prior to your arrival date when possible. If you are planning to stay in a hotel, know that you will likely need to bring your crate. Even if the hotel or motel offers a dog bed, it is likely they will require your animal to be crated while room services refreshes your room. Having a crate is a good idea anyway, as it can provide a sense of security and comfort for an animal that is anxious when away from home. Line it with old blankets, T-shirts and sheets – the mustier the better. Your dog or cat will associate those smells with home and comfort. Bringing some favorite toys along will help keep your pet happy and calm. It is a good idea to stick to your pet’s normal schedule – try to keep feedings, walks, play time or rubdowns close to your normal schedule at home. Not only will this ensure that you spend an adequate amount of time with your pet on a daily basis, but it will also help them adjust to new surroundings. See our other articles for more tips on pet-friendly accommodation and travel, or search for accommodations now. Make sure you clean up after your pet to ensure the hotel’s pet policy stays liberal. We want to make it good for the next guy. Other than that, the rest is up to you. It’s important you bring what you need and know where you are going before stepping on board the airplane or backing up out of the garage. If you intend to fly on an airlines that provides pet friendly accommodation, make sure you know their rules and regulations. Typically whether your pet flies in the cabin or cargo hold depends on the size of your animal. Some animals, short-nosed dogs, are not permitted to fly at all because it can cause harm to their respiratory system. If your dog is placed in cargo, the airlines is very particular about the temperatures of the places you will be passing through. It will not allow a dog in cargo if extreme temperatures are inevitable. Whether your pet flies in the cabin or cargo hold, make sure you line it with old blankets, T-shirts and sheets – the mustier the better. Your dog or cat will associate those smells with home and comfort. Add some favorite toys, too. Driving is a cinch with pets in America. Our hotels may be reserved from your mobile phone, so if you have your course even somewhat charted, you should easily be able to find a hotel that provides pet friendly accommodation. When possible, we advise you call the hotel a w eek or two before arriving to let them know you will be bringing your pets. Some hotels even require this. You can also find nearby pet friendly restaurants, parks and whatever else you need to make your travels with your pet easy. 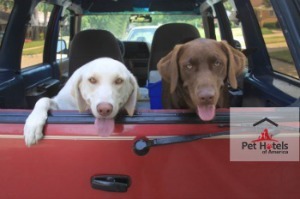 Here’s a good article on Road Trips with pets. Wherever you plan to take your vacation, there are rules of thumb to follow. First, make sure you have your pets checked by a veterinarian before leaving. Tell your vet where you are going and see if there are specific things to watch for. Bring all vaccination records with you. Make sure you pets have their tags at all times. Always bring along photos of your pet with your name and phone number should you get separated. These are just precautionary measures. Most important, take lots of photos as this will most likely be one of the most memorable vacations you will have. Traveling with pets is fun!